The tenderloin is simply the best cut of pork there is. And since nothing less than the best will do for your dog, serve him CESAR® Pork Tenderloin Flavour. 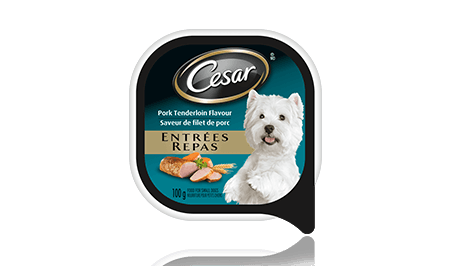 CESAR® Entrées Pork Tenderloin Flavour Food For Small Dogs is formulated to meet the nutritional levels established by the AAFCO Dog Food Nutrient Profiles for maintenance.